Each of our products are manufactured to your specifications from thousands of configurations, thus, returned items are subject to a 25% restock charge plus shipping costs back to the factory. Large orders can be subject to a higher restock charge. 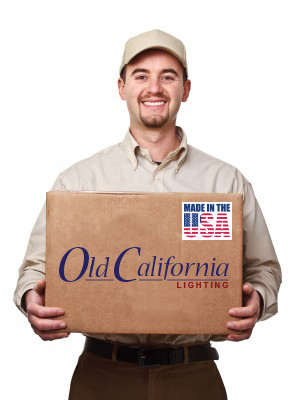 Contact jdack@oldcalifornia.com to discuss the details and acquire a return goods authorization, (RGA). Lighting fixtures will not be accepted by our Receiving Department without an (RGA) number. To return an item, it must be returned to Old California within three weeks of the ship date freight prepaid. (No Exceptions) Returned items must be received by us in original condition with original packaging and must not have been installed. Pack the item carefully in the original packaging, in the manner that it was shipped. Items that have been damaged during return shipment are the buyer's responsibility. For your protection, please obtain insurance on items being returned.